Are you interested in trying to increase your savings? Maybe you harbor dreams of early retirement? Here are ten simple tips that will help you save more money and reach your goals. 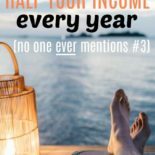 I want to share the strategies we have used to consistently save 50% of our income for nearly a decade! 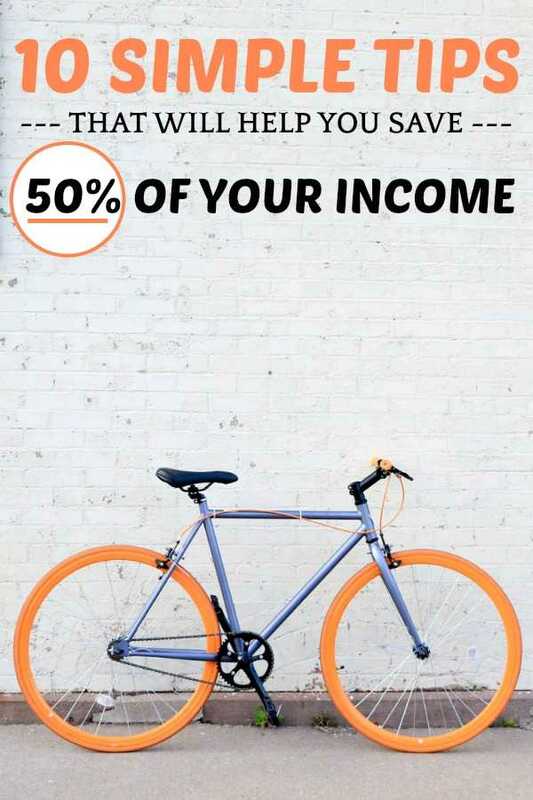 Read on to find out how to start saving half of your income, today. The tips here are simple; it’s the sticking to them that is the difficult part. If this was something everyone did, the world would have a lot more millionaires! However, if you are willing to tough it out, you can reap huge rewards. Our family has managed to save half of our income for nearly ten years, starting from when I met my husband fresh out of graduate school, in early 2009. Here are some tips on how to save half your income. The idea of using money that you don’t have to buy things that you probably don’t need is pretty crazy if you think about it. Using credit cards too frequently can lead to staggering debt, poor credit, and even cost you in outrageous interest charges. According to recent data by the Federal Reserve, the average American household carries $137,063 in debt. Compare that to the average household income of $59,039 and you can see that most Americans are living far beyond their means. Avoid credit cards as much as possible. I only have one credit card, the Chase Freedom card, for which I earn 1.5% back on all my purchases. 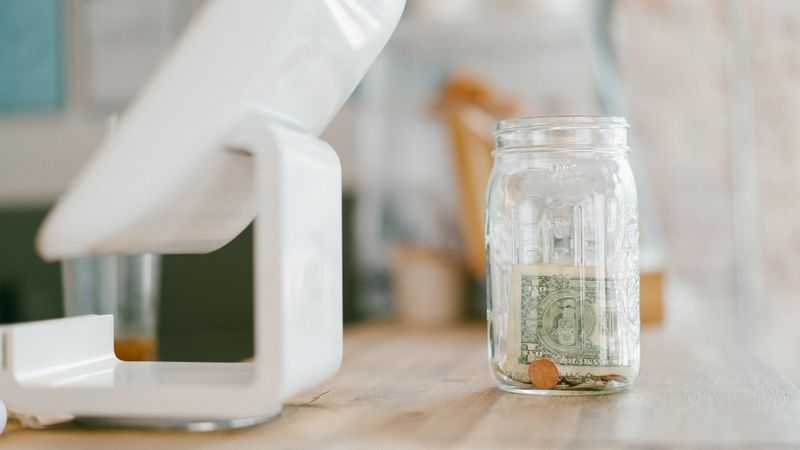 When debt is unavoidable, such as for college expenses, try and pay it off as soon as possible following graduation using the other methods listed below to save money quickly. Additionally, if you work in certain fields (education, healthcare, etc) in dedicated “public service areas” you might also be able to take advantage of student loan forgiveness programs. Make sure you are educated about eligibility in your particular field prior to graduating. I’m not talking about sports leagues here. 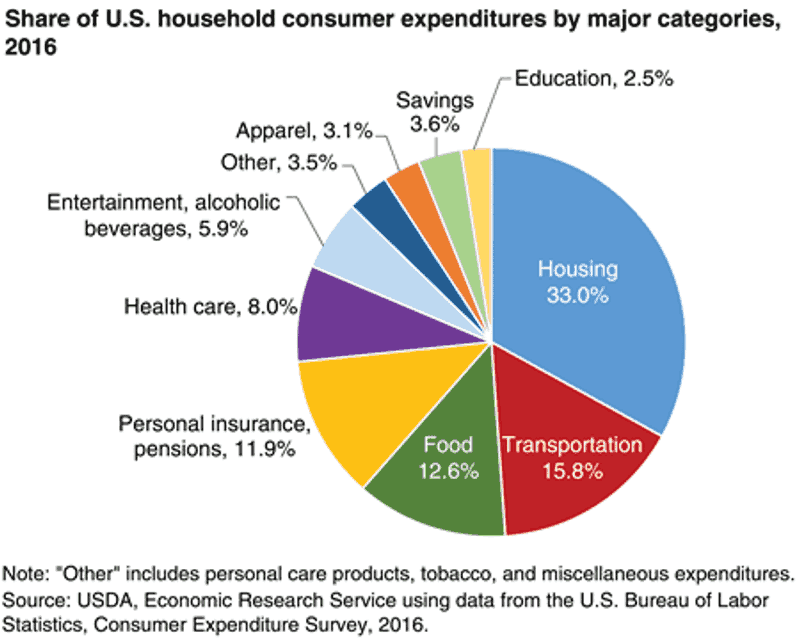 The “big three” are expenses that make up the three largest portions of annual consumer expenditures: housing, transportation, and food. As of 2016, the average American spends about 33% of their money on housing, 15.8% on transportation, and 12.6% on food. Savings clocked in at a paltry 3.6% of total income. If you can cut down on the biggest three expenses, you can significantly reduce your overall yearly expenditures. We accomplish this by living in a small home, keeping our transportation costs low, and reducing our grocery expenses. This might be controversial, but I am going to come right out and say it anyway. There is a reason I listed the “put off having children” section right after the big three. If and when you chose to have children, your expenses probably are going to increase (there are exceptions, but that is the norm). The biggest increase will the in those “big three” categories. You will want more space, you will need more food, and you might even need a larger car — which means more gas mileage. There is also the possibility of losing one parent’s income, depending on childcare resources. Some parents choose to stay at home; for others, it might be a forced choice as childcare costs outstrip what one parent’s income would be returning to work. I have noticed many early retirement gurus accumulated their wealth and retired before having children. By working hard while you are younger, you can build momentum and savings so that you have plenty of money accumulated by the time you have children. How can you save money if you don’t know how much money you are spending in the first place? Once you have a clear picture of how much you are spending each month, you can “trim the fat” as I call it. Outside of the big three, are there any areas that are “wants” rather than “needs”? Do you have a gym membership that you never use? A Netflix subscription — but you can never find anything to watch? 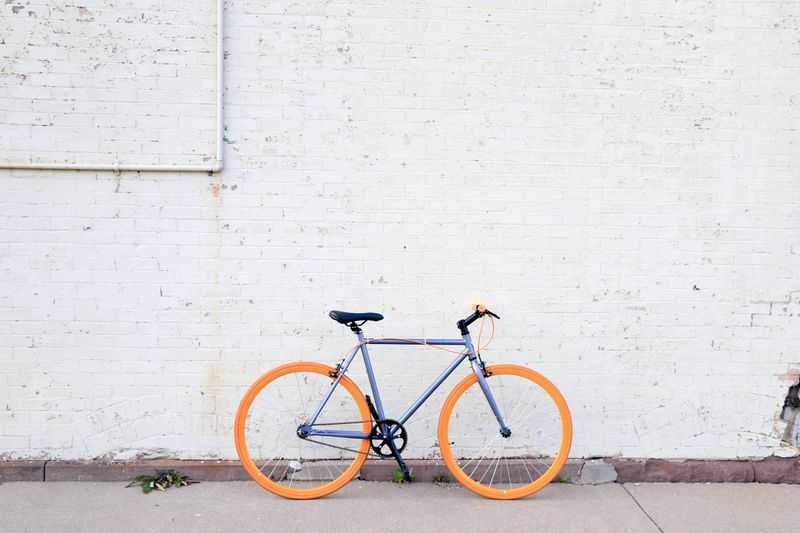 Do you drive your car when you could save mileage and gas money by riding a bike or walking? Trimming the fat means getting rid of those extra expenses that are eating up your money. How much you trim depends on how fast you want to save money — and how far you are willing to go. Cutting expenses is a great way to save some extra cash — but in the end, there’s only so much you can cut down on spending. After all, people have to eat, right? And most would also like a place to live. Besides budgeting to save, you should also try and increase your earnings whenever possible. This is particularly important for people earning minimum wage or who have low salaries. Reject the keeping up with the Jones’ attitude! Even if your earnings increase, try to keep your expenses at the same level. Any extra income is money in the bank, baby. When you have the right attitude towards money and finances, budgeting and saving can even be fun! I am proud that half my wardrobe comes from Goodwill — you better believe I look damn good in that 100% alpaca wool skirt I got for $2! Grab a hammer, a paintbrush, and your best MacGyver attitude. You can do this! In this day and age, you can teach yourself basically any skill with a quick browse on Google or YouTube. Instead of eating out, learn how to cook amazing meals at home. Instead of going to a hair salon, invest in a good hair grooming kit (I use these). Learning to sew can also save you money if you can repair clothes rather than always replacing them. There are tons of creative ways that you can save more by doing it yourself at home. Sneaky fees aren’t just for credit cards. You can incur late fees with nearly every bill that you pay. Being forgetful can cost you big bucks! I recently forgot to pay a bill on time and boom! — there goes $25 I could have saved for something else. Yep, you can even rack up late fees at the FREE public library. Automate whatever bills you can and make sure to track the rest and pay on time. Think that saving money is enough? Think again! A million dollars might sound good right now…but by the time you are ready to retire, that million could be worth way less — all because of inflation. Inflation is the big bad monster that is gobbling up your savings by an average of 2% – 4% every year. That’s why simply putting money in the bank isn’t enough. Even the best high-interest bank accounts, like American Express High-Yield Savings, accounts only return 1.85% annually. That isn’t even enough to offset inflation. So what can you do? Well, you can start by contributing your 401k, if you have one through your company, especially if your company matches your contribution. You can also start investing in the stock market. The Oracle from Omaha, Warren Buffet himself generally recommends investing in index mutual funds rather than picking individual stocks to try and beat the market. Vanguard is one of the best online brokers and if you are ready to start investing, make sure to check them out. Please note: I am not an investment professional. Please make sure to thoroughly research when choosing who/where/what to invest. I hope that you enjoyed these tips on how to increase your savings and save half of your income! Let you know what budget areas you have the hardest time sticking to in the comment section below. Great tips and advice, Marissa! There’s a couple things I’m trimming down this month! Best of luck and let me know if you need any eyes on the budget, Julie! I love this!! As you probably know, I can’t wait to be done with our debt and start using our money for better things!! –Also whatever Warren says, I’m all ears! I know and you guys are SO CLOSE! It’s really exciting, I can’t wait to see that update. I just wish the market would have a nice little drop soon for taking Warren’s advice. There’s been a recession for every Republican president since Teddy Roosevelt in their first year in office, so we still have some time ;). I have been needing to re-do my saving plans! Thanks for adding some great ideas to my list!